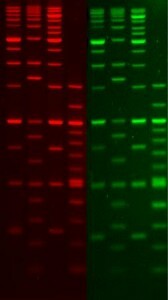 GelGreen™ is a sensitive, stable and environmentally safe green fluorescent nucleic acid dye designed to stain either dsDNA, ssDNA or RNA in agarose gels. GelGreen is far more sensitive than SYBR Safe (Figure 1). Unlike SYBR dyes, which are known to be unstable, GelGreen is very stable, both hydrolytically and thermally. GelGreen has a UV absorption between 250 nm and 300 nm and a strong absorption peak centered around 500 nm (Figure 2). Thus, GelGreen is compatible with either a 254 nm UV transilluminator or a gel reader equipped with visible light excitation (such as a 488 nm laser-based gel scanner or a Dark Reader). GelGreen can be used for either post gel staining or precast gel staining. A series of safety tests have confirmed that GelGreen™ is noncytotoxic, nonmutagenic and nonhazardous at concentrations well above the working concentrations used in gel staining. As a result, GelGreen can be safely disposed of down the drain or in regular trash, providing convenience and reducing cost in waste disposal. GelGreen™ 10,000X solution in water is our latest formulation that eliminates the hazards of handling DMSO for better safety, and is recommended for new users of GelGreen™. We continue to offer GelGreen™ 10,000X solution in DMSO for established users who do not wish to change their existing laboratory protocols. Compatible with downstream DNA manipulations such as restriction digest, sequencing and cloning. Figure 1. Comparison of SYBR Safe and GelGreen in post gel staining using 1% agarose gel in TBE buffer. Two-fold serial dilutions of 1 kb Plus DNA Ladder from Invitrogen were loaded onto each gel in 4 lanes in the amounts of 200 ng, 100 ng and 50 ng, respectively, from left to right. Gels were imaged using 254-nm transillumination and photographed with a SYBR filter and Polaroid 667 black-and-white print films. Note: *GelGreen and GelRed and their uses are covered by US patent numbers 7960498, 7803943, and 8232050. **SYBR is trademark of Molecular Probes, Inc. and GelStar is trademark of FMC corporation. Full List of Blog Posts..